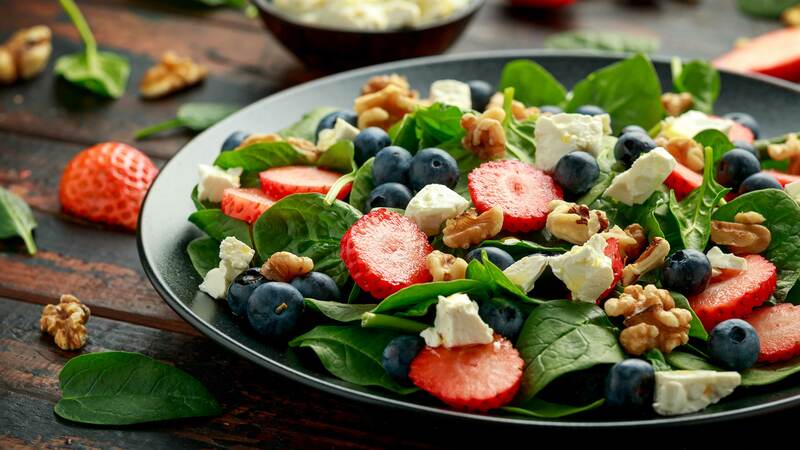 In large serving bowl combine spinach or salad greens, strawberries, blueberries, blackberries or raspberries. If using frozen fruit, only partially thaw so that the fruit keeps its shape. Add walnuts, cheese and toss with vinaigrette. Garnish with sliced kiwi. Serve at once. Combine olive oil, vinegar, honey, mustard, salt and pepper and whisk together until blended. This salad can be partially prepared in advance. Combine greens and fruit and refrigerate until ready to serve. Just before serving add remaining ingredients and toss with vinaigrette to coat.